溶解度 ≥34.1mg/mL in DMSO 储存条件 24 months after receival at -20°C in the dark. Transportation: at room temperature for up to 3 weeks. Avoid prolonged exposure to light. Desiccate. 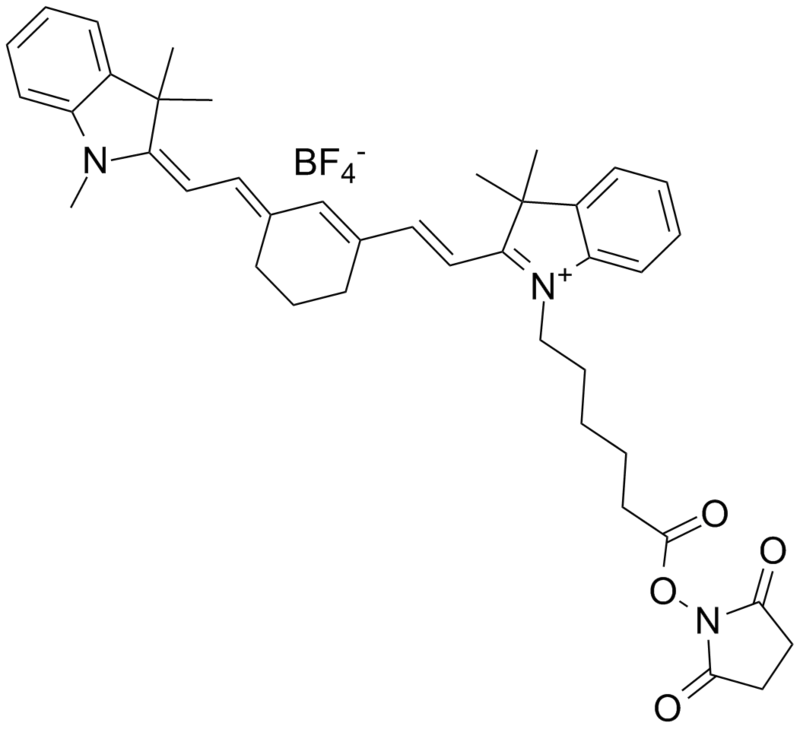 Cy7 NHS ester, also called Cy7 monofunctional N-hydroxysuccinimide ester or Cy7-NHS , is a near-infrared fluorescent  and soluble sulfonated cyanine dye  with a molecular weight of 828 Da, able to be dissolved in DMSO  and ready for conjugation to proteins . Cy7 NHS ester acts as a donor of Cy7 . Cy7 has an emission maximum at 767nm, an absorption maximum at 743nm and its ε743=200,000 cm-1M-1 . Compared with Cy5.5, Cy7 has fewer sulfonate groups and an extra methine group that contributes to hydrophobicity. Antibodies labeled with either Cy7 or Cy5.5 succinimidyl esters have similar quenching efficiencies . N-acylation can occur between a Cy7 NHS ester and a primary amino group. This type of reaction is also widely used to allow amide formation under milder conditions without base or coupling reagent . Most derivatives of non-sulfonated cyanines have low aqueous solubility except for hydrochlorides of hydrazides and amines. For biomolecule labeling, using of organic co-solvent (5-20% of DMF or DMSO) to dissolve this molecular is necessary for efficient reaction. Cyanine dye should be dissolved in organic solvent first, and added to a solution of biomolecule (protein, peptide, amino-labeled DNA) in appropriate aqueous buffer. Incubated with Cy7 NHS, LS174T cells showed negligible signals in fluorescent microscopic images, it illustrated that possibility of nonspecific binding between free Cy7 and LS174T cells was negligible . In vivo, injection of Cy7-NHS for 15 minutes resulted in the fluorescent signal in the whole body of a mouse bearing LS174T tumors, but from the blank mouse, no autofluorescence was detected. This result suggested the rapid distribution of Cy7 NHS in the body of the mouse. 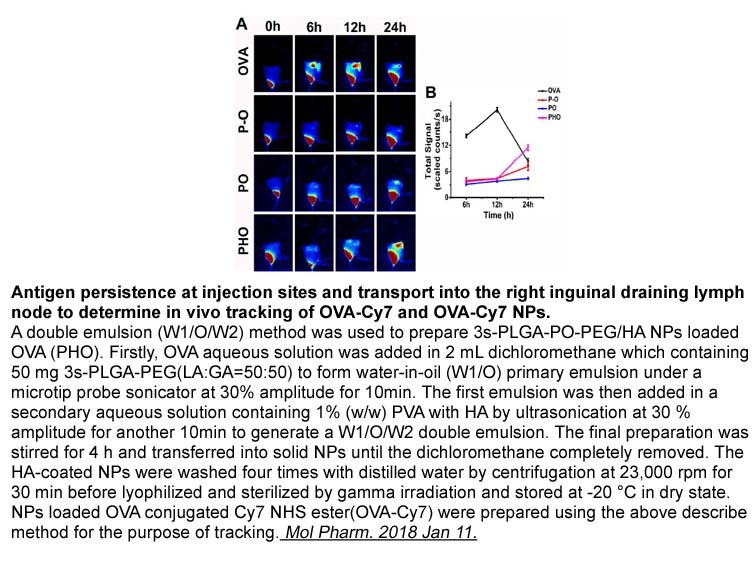 Subsequently, Cy7 NHS was rapidly eliminated from the kidney and no fluorescence was detected on the mouse 96 hours post-injection .
. Peng Zou, Songbo Xu, Stephen P. Povoski, et al. Near-Infrared Fluorescence Labeled Anti-TAG-72 Monoclonal Antibodies for Tumor Imaging in Colorectal Cancer Xenograft Mice. Mol Pharm., 2009, 6(2): 428-440.
. Martin L. Brady, Raghu Raghavan, Deep Singh, et al. In vivo performance of a microfabricated catheter for intraparenchymal delivery. Journal of Neuroscience Methods, 2014, 229: 76-83.
. Valeri Metelev, Surong Zhang, David Tabatadze, et al. The three-dimensional context of a double helix determines fluorescence of the internucleoside-tethered pair of fluorophores. Mol Biosyst., 2013, 9(10): 2447-2453.
. Manfred Birchler, Giovanni Neri, Lorenzo Tarli, et al. Infrared photodetection for the in vivo localisation of phage-derived antibodies directed against angiogenic markers. Journal of Immunological Methods, 1999, 231: 239-248.
. Benedict Law, Alejandro Curino, Thomas H. Bugge, et al. Design, Synthesis, and Characterization of Urokinase Plasminogen-Activator-Sensitive Near-Infrared Reporter. Chemistry & Biology, 2004, 11: 99-106.
. M. Bai and D.J. Bornhop. 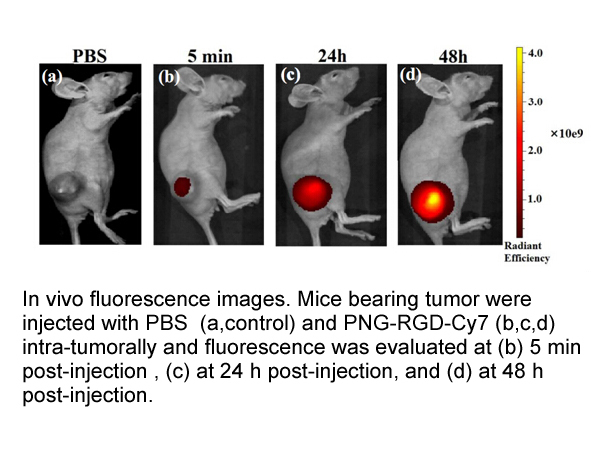 Recent Advances in Receptor-Targeted Fluorescent Probes for In Vivo Cancer Imaging. Current Medicinal Chemistry, 2012, 19(1): 1-17.